Married at 15, she lost her young husband, Etienne, the love of her life, when she was 24. She didn’t know how she could go on without him. Even if she could pull herself out of her deep depression, how would she feed her babies? Or her mother? Christime was a noblewoman in the Court of France, but she was Italian. She needed to make money, but noblewomen did no work. And she had no skills. Christine put this, her terrible grief, into poetry. That I do not know if I can bear it. Intrigued that a woman could write, court nobles wanted to talk to her. Soon, she was being commissioned to write ballads for them. 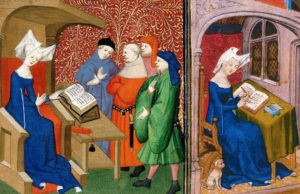 An avid reader, Christine was incensed about the denigration of women in writing, especially in the wildly popular 13th century French long poem, The Romance of the Rose. At court, she initiates debates with noblemen about the treatment of women in literary works, and became known for what she was – an intellectual and a writer. Christine fought all her life for the fair depiction of women in writing, saying that sexuality was a normal function, and not the way women led men to Hell. Her two most famous books championed women. One was about women’s accomplishments, the other about how to make a living. 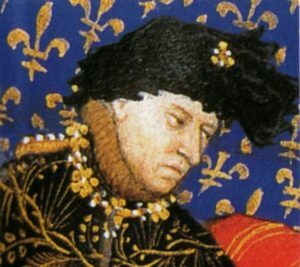 Charles VI commissioned Christine to write a history of his father, the beloved Charles V. This was unheard of. Her last book, written when she was in her sixties, was about Joan of Arc. 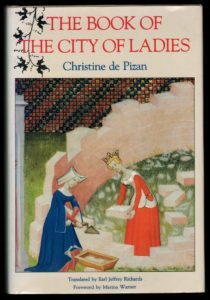 Christine de Pizan has been called the world’s first feminist. The first feminist? Maybe we should walk that back by about 3,200 years to the 1806–1802 B.C. reign of Sobekneferu. “More than five other women are speculated to have ruled Egypt as pharaohs prior to Sobekneferu, but she is the first one confirmed by evidence.” This is no complaint, however, since Christine was also a writer, and being either a feminist or a woman writer in 1388 was quite an accomplishment. Actually, it’s still quite an accomplishment! I’m glad to hear her story.